So, I saw this play that you should go and see. ... See, the thing is, I can’t actually tell you. 1.) Do not see or read the play beforehand. Learn nothing about it. 2.) Prepare an ostrich impersonation. The night of the show, they walk onto the stage and are handed the script of White Rabbit, Red Rabbit to perform. Cold. No preparation time - no inkling of the words; no clue to the content. I love the idea of this, as I imagine this is every actor’s greatest fear and most appealing challenge; deliver a script, make it an amazing, unforgettable performance – but know none of the lines. Each night brings a difference actor; mine (and yes, she does feel like mine now) was Jess Holly Bates. She turned out a beautiful performance, especially considering she was thrown out into space without a safety net. She has that quality that makes you unable to stop watching her and considering her words; and by the end the entire audience was maybe as protective of her as she was of us. I can’t say anymore than that without giving things away, but let me tell you, the very next production I see with Bates’ name attached, I’m buying tickets. I still can’t tell you anything about White Rabbit, Red Rabbit. But, trust me. You’re better off going, not knowing what to expect. It’s a deeply personal, subjective experience, and yet somehow you’re going on this journey with the actor and the audience and you’re all in it together. Some people might be worried they won’t get it – trust me, you will. You have no idea what’s coming next; but it’s a journey – a little bit is revealed each step of the way to create an experience unlike any I’ve had in theatre. 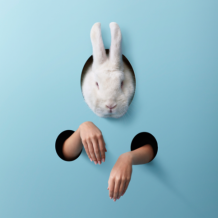 Silo theatre are currently performing White Rabbit, Red Rabbit at Q theatre, and due to popular demand have added two extra shows. White Rabbit, Red Rabbit is an intriguing, mysterious, sad, hilarious, beautiful, concept. Well done to Silo theatre for bringing this secret play to Auckland – like they say: You have to be there.